Soya, Japan´s first Antarctic exploration vessel, today forms a key exhibit of Tokyo´s Maritime Museum. Originally ordered in 1936 by the Soviet Union as one of three cargo icebreakers under the name Borochavets, and launched in 1938, the deal was cancelled and the ship commissioned in Japan as Chiryo Maru. In 1940, the vessel was taken over by the Imperial Japanese Navy, probably to transport ordnance. She was renamed Soya after a province in Hokkaido and the strait between Hokkaido and Sachalin. 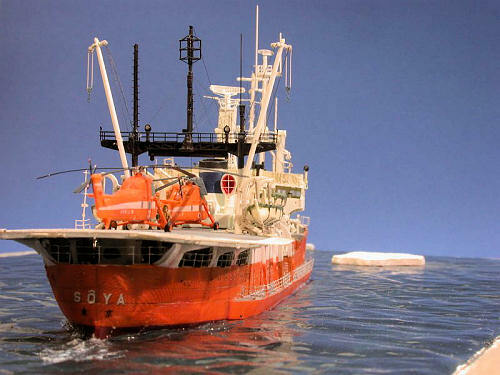 Soya survived the war and in 1956 was extensively converted for Antarctic exploration service. Between 1956 and 1962, she undertook six trips to the Antarctic. At Luetzow-Holm - Bay on Queen Maud – Land, the Japanese scientific station Showa was constructed. During the 1957-8 expedition, Soya developed technical defects, necessitating her premature return, assisted by USCG Burton Island. Upon this hasty departure, the expedition´s twelve sled dogs were abandoned and presumed dead. Surprisingly, two of the dogs were found alive upon the arrival of the next expedition a year later. These two dogs, Taro and Jiro, became immensely popular in Japan. Jiro died while still in the Antarctic in 1960, but Taro was taken home and lived out his life until 1970 in Sapporo´s University of Hokkaido. Both animals were stuffed and are on display at Sapporo and Tokyo respectively. Until today, the expedition, the ship and the dogs are remembered – in stamps and movies, amongst others. This may be a reason why Soya has been preserved. She had been replaced in Antarctic service in 1962 and was used as an icebreaker in Hokkaido until 1978. Since then, she is a museum ship at Tokyo. Immediately upon learning that Hasegawa issued such an interesting kit, I wanted one. Sadly I missed the first limited edition, and I half forgot about it until I received a review example of the second edition. 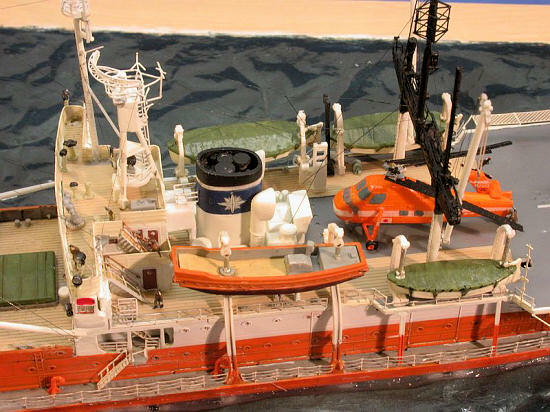 This kit depicts the vessel after reconstruction undertaken to operate the larger S-58 helicopters, and it looks markedly different from the first issue. 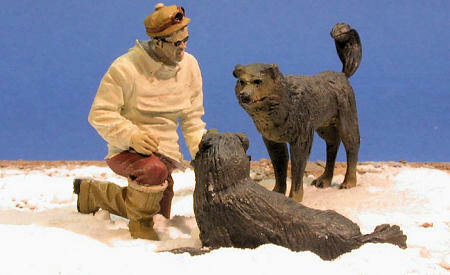 White metal figures of a crew member and two sled dogs are included as a bonus – obviously those are the two famous dogs mentioned above. Apart from this bonus, the kit comprises sixteen sprues white styrene, four sprues of clear styrene and one of bronze styrene. 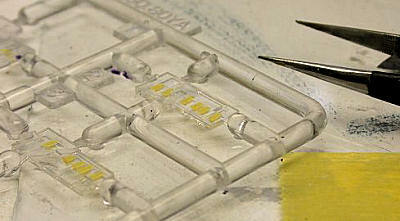 A large decal sheet, a piece of chain and a piece of wire complete the kit. The parts are finely detailed, crisply molded, with no apparent flaws. The sheer number of small and delicate parts is overwhelming, the parts count for this pretty small vessel is a whopping 323. The five aircraft are especially nice. Two Bell 47 (molded in clear styrene), two S-58 and a DHC-2 Beaver are included. The decal sheet is especially nice. Printed in high quality, it contains a plethora of markings for the vessel and the aircraft, with crucial items included double, which is a nice touch by the manufacturer and surely one that will help in keeping the modeler´s blood pressure at an acceptable level during decaling. Another nice touch is the inclusion of decals for the Bells´ lattice tail – that should go some way in making the helos look more convincing. Another strong point of the kit is the instruction booklet, though not the info on the vessel – apart from five rather hidden lines, it´s all Japanese. The rest is cutting edge. The 22 steps are drawn extremely clearly and precisely, and they even follow a logical construction sequence (which is quite uncommon with other manufacturers); possible issues are adressed, and the colour callouts (referenced to Gunze paints) include real names. There are full references as to which parts are to be replaced by the matching Hasegawa PE set. The painting and decaling guides are very clear and concise, too. My personal highlight was the inclusion of seven (!) rigging plans that literally leave no question unanswered. The matching PE set and the Gunze paint set complete the material needed. The PE is exceptionally complex and very delicate. Relief etching has been extensively employed to include fold marks to ease construction, and most of the parts are easily removed from the fret. Some of the parts are very fiddly and hard to work with, though. 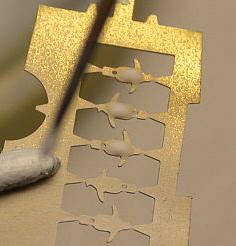 The railing pieces are individually etched – that eases work but leaves no reserves when botching a part. The paints work fine, but they need the special Gunze thinner, other thinners will not work. A possible replacement when working with acrylics would be Vallejo #829 Amaranth Red for the upper hull, and #946 dark red for the lower hull. Best check it yourself! Further reference was found at www.modelwarships.com – Dave Lockhart has taken a lot of images aboard Soya and published his walkaround. Construction commenced with the multi-part hull; careful assembly helped preserve the delicate surface. Liquid cement was applied from the inside and did a good job in getting the hull both sturdy and clean. The numerous bulkheads were added, seams were cleaned up, all the portholes were drilled open – pretty soon the hull was ready for painting. I started by spraying a grey primer; the insides of the bulwarks were sprayed Xtracrylix Neutral Grey. Now the entire hull was sprayed Gunze Orange, yet in v arying thickness, utilizing the grey primer as a sort of pre-shading. 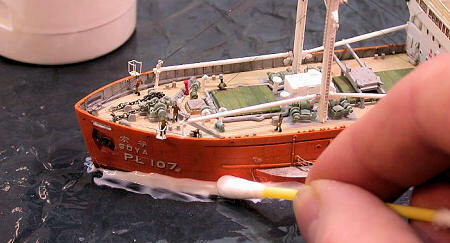 Marking the waterline was eased by the painting plan which is provided in the model´s actual size. I did use extra-fine masking tape and Tamiya tape for this demarcation. Prior to spraying the new shade I resprayed orange over the tape – now the original shade would creep into any glitch in the masking and save extra work. After spraying the lower hull, the white areas were masked and sprayed in a like manner. After drying, the lower hull was cut away a few mi llimeters below the water line. 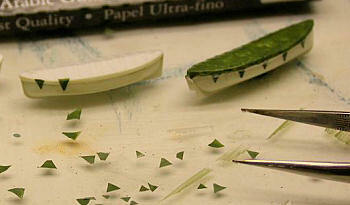 After cleanup, the hull was ready to be fit into the diorama, the making of which is detailed below. Now the decks were painted. Various acrylic paints were used, the caulking was highlighted with an acrylic wash. The numerous deck fittings were hand painted Xtracrylix Neutral Grey. The flight deck was sprayed Xtracrylix Extra Dark Sea Grey and gloss-coated with Future to ease decaling. Future was also used to prepare the hull for decaling. The decals worked fine with some use of Micro Sol, and no silvering was observed. After drying, they were sealed with another layer of Future and then an acrylic flat coat. The numerous deck fittings on the quarterdeck were made and added in an uneventful manner (you need that now and then, too). The two large and very cleanly molded winches were painted a bluish-greenish mixture of RLM 65 and 83. A dark wash enhanced the nice details. Two watertight doors were added from leftovers from a WEM PE set for HMS Hood. Now the flight deck could be glued and secured using various clamps. Some parts cause really disproportionate problems. This may be due to the complexity of the part in itself or to the trepidations the modeler has re working with the part. I really dislike working with clear styrene due to the brittleness of the material and the implied risks of working with the material. Seeing the front of the bridge being molded in clear styrene, I was not happy at all. I would have much preferred having some nice and clean rectangular openings for the bridge windows – fill them with white glue and be happy. In this case you need to mask the numerous windows meticulously, which is an exercise in frustration in itself. To add insult to injury, you are supposed to add decals with the wooden window frames/surrounds after painting, which means you end up with decal film over your prized clear styrene anyway, taking away from the intended crystal clear transparency. I tried several times to mask the windows using liquid mask (Humbrol Maskol), which didn´t work out and necessitated removing the acrylic paint with white spirit. In the end I bit the bullet and masked the windows using tiny rectangles cut from Tamiya tape – tedious but the only method I saw. As expected, the decal film made the windows less transparent. The next disappointment was assembling the bridge structure – I ended up with gaps that needed filling and sanding in the immediate vicinity of abovementioned fiddly decals. The bridge structure´s inclined ladders were replaced by Saemann and WEM parts – the very limited space on the upper decks necessitated using the WEM parts. To me, WEM and Saemann inclined ladders are superior in 1:350 scale as you can actually bend the individual steps. Now I started working with the Hasegawa PE in earnest. The railings are individual and well fitting parts – hence all the posts and blockouts are where they need to be. Moreover, each part has a relief-etched folding base which makes for excellent gluing to the deck, but is more visible than standard PE railings´ narrow base. The downside of having individual parts is obviously that you have no room for goofs, errors and blunders, as no spare railing is provided. I started with the numerous parts for the stern, then those at the superstructure. The latter were coated with white glue and painted JPS RAF White to simulate the canvas dodgers. The small yet intricate radar mast proved a formidable opponent. The PE parts were pretty demanding to work with and took a lot of time. I had to lengthen the shaft of the radar antenna as it had no sufficient clearance. The mast was completed but not yet added to the vessel to prevent damage from handling the model. Contrary to the instructions I continued with the plethora of deck fittings on the fore deck and astern the superstructure – winches, vents, cable reels and the like. The funnel was assembled, cleaned up, the PE lad ders were added, and then the funnel was painted white. The blue and the black stripe were also painted. I opted for using the decals for the emblems instead of the PE parts. 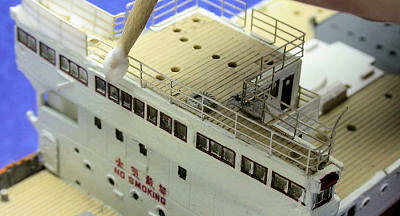 The masts were built straight OOB – they are highly detailed and fiddly enough as they are. The canvas covers for the boats were molded on yet I felt they could do with some more texture. So I added a cover from cigarette paper soaked in thinned white glue. The triangular pieces with the eyes for the tie-down were added from pieces of cigarette paper painted and cut to shape. The decal sheet contains decals for that purpose, too, but I chose to use my own version in this case. Working from the center to the sides, I arrived at the deck edges, adding railings and flight deck netting. It is advisable to add these fragile items not too soon, as they hardly stand handling. The sounding platforms are especially delicate. Having added every last item, I gave the ship a flat coat to blend everything in. Having a well-kept vessel, only rather subdued weathering was applied using pastel chalks. 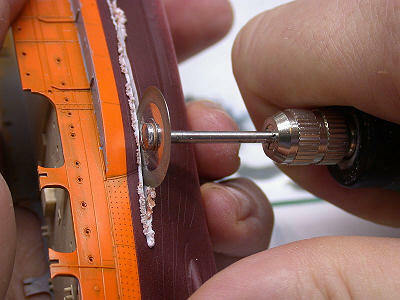 The aircraft provided are intricate models in their own right, especially when using the PE parts. I decided not to use the Bell 47 but to keep them for another project. 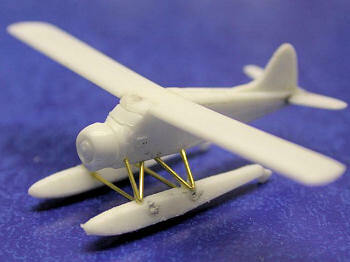 The hardest part was making the DHC-2´s undercarriage. I used the styrene parts as patterns for making the parts from .4 mm brass wire – that was easier to clean up and ended up with a sturdier result. To end up with crisp bends, I used a diamond disc in a motor tool to make grooves at the bending points prior to bending the wire. For better stability, the helicopters did not receive PE undercarriage – moreover, the styrene looked more the part as it was round and not flat. The decals worked fine, but I could not align them properly with the recessed panel lines. I depicted the tail of one helicopter folded. The open inside was painted interior green. The very nice relief etched rotors were pre-bent and added. The diorama was built from a picture frame. The glass pane and its backing was removed, and the wooden frame mounted atop a piece of particle board covered with finely crinkled household aluminum foil. A thin layer of Vaseline between particle board and foil improves adhesion and prevents excess crinkling. Now plaster was poured into the frame from its backside to a layer of about half an inch for stability. Excess plaster was poured onto the glass pane in a thinner layer. The surface of the wet plaster on the glass pane was covered with baking soda. After curing, the frame was removed from the particle board, excess plaster was cleaned up and I was able to mount the ship. The pretty soft plaster allowed easy carving so the vessel fit pretty snugly into the still surface I had in mind. Wanting to show the ship approaching the coast at minimal speed, I added a bit of coastline to one corner of the diorama, again using plaster cast into a makeshift mold of wooden profiles. The plaster from the glass pane was broken into conveniently sized pieces for ice floes and rocks for the coastline. Again baking soda was used to add some texture to the surfaces. After curing and masking the wooden frame, the base was painted. The water was sprayed JPS acrylic Sea Blue, the ice floes were painted with white wall paint, and the rocky areas were brushpainted using various grey acrylics. I made the mistake of adding an enamel gloss coat before letting the plaster dry completely – unsighty bubbles from the escaping moisture were the result. Hence I needed many layers of gloss coat before arriving at a satisfying result. The ice floes were added to the base using white glue. Some inevitable touchups followed. To complete the diorama, I needed some figures of people and some animals. From the PE set, I used the penguins, made a bit more rotund by applying white glue to their bellies, but sadly three out of the five penguins went AWOL during the build. So I had to make replacements. 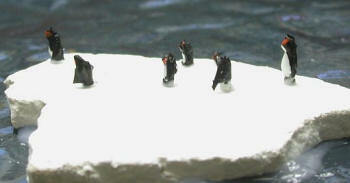 I could not make my penguins as small as the PE birds had been, so I checked out penguin sizes on the net. Luckily, emperor penguins at 4 ft would end up at 3.5 mm and be manageable. The smaller species were just too tiny for me. After some deliberations I started with some styrene rod that was carved and filed into the likeness of a penguin´s head. The winglets were made from paper, and the well-rounded belly was made from white glue. After careful painting the birds look credible to the naked eye and were glued to the ice floes. 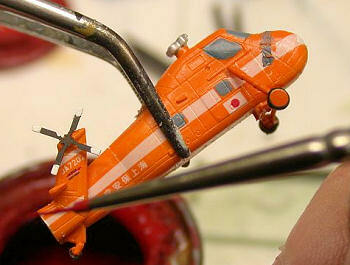 The crew figures are a mix of Preiser styrene and L´Arsénal resin figures, painted and spread over the ship and around the aircraft at the coastline. The vessel was rigged ove r the course of several highly unpleasant evenings, using stretched sprue. The excellent rigging diagrams left no chickening out for alleged want of documentation, but the fragility of the material made me destroy half of what I added so I had to redo a lot of what I did. I tend to liken this process with shaving a rubber balloon with a chainsaw. Finally I called it quits, made some last touchups and added the vessel to the base. For this process, clear acrylic gel was used, which was applied with artist´s spatulas in several layers (the stuff shrinks!) Excesses were removed using q-tips. After several days of curing, I was really done. 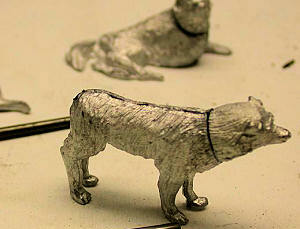 I also built the white metal figures, but being anything but a figure modeler (let alone painter!) I just made them in a very basic way. Despite careful cleanup, they needed quite some filling and sanding after assembling the parts using CA glue. A motor tool proved very helpful. After priming the metal figures using Gunze´s Mr Metal Primer, they were sprayed MM enamel primer and then brush painted with various acrylics. For the dogs, I also used my airbrush. Some slight drybrushing completed the minimalist approach to figure painting. This is an excellent kit, though it is challenging and partly over-engineered. I needed several breaks and in-between projects to keep up sufficient motivation for it. If you can lay your hands on it, I do recommend it – and rather with the PE than without it!